You can add a manual fill from either the Orders pane or the Fills pane within the Orders and Fills Window. 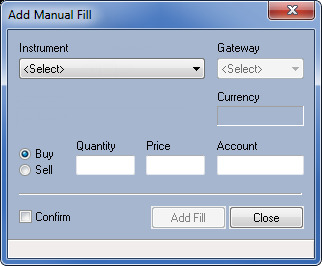 Note: In order to save a manual fill, you must enable the Save Manual Fills option on the Fill tab in the Properties menu. In the Fills pane or Orders pane, right-click an open area and choose Add Manual Fill. The Add Manual Fill dialog box appears. From the Instrument field, used the Instrument Explorer to select a instrument. Tip: Place your cursor on a specific fill in the Fills pane to pre-populate the Add Manual Fill dialog box with information. From the Gateway or Broker field, click the gateway or broker to associate the fill with. Note: The Broker field is only available when running X_TRADER in X_TRADER ASP mode. In the Action field, click Buy or Sell. In the Quantity field, type the appropriate value. In the Price field, type the appropriate value. After you complete all mandatory fields, Add Fill enables. If you want to see the formatted fill before you add it, click the Confirm checkbox. Click the Add Fill button. The manual fill is added to the Orders and Fills window. If you clicked the Confirm checkbox, you must confirm the manual fill.